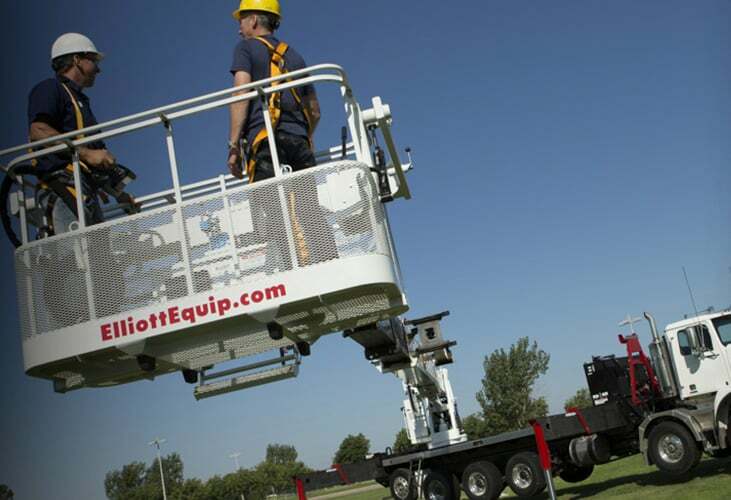 At Elliott Equipment Company, we pride ourselves on our commitment to listening to customers’ needs and working with them to design cranes and aerial work platforms built to suit their work. Our E-Line models are the perfect example: By working closely with a nationwide electrical contractor, we created a new product line that suits their wide array of projects, and increases efficiency resulting in significantly shortened project timelines. The E-Line story starts with Ray Holland, Vice President of Operations for MYR Group. 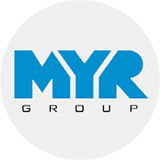 MYR Group is a major electrical contractor in North America, serving the U.S. and Canada from 23 locations across the continent. The firm specializes in large transmission line construction, but in Holland’s words, “We do it all.” In 2015, updates to an OSHA standard threatened to lengthen set-up times for firms using cranes with pin-on baskets. That included MYR Group. According to Holland, every time one of his crews repositioned a crane, they would be required to conduct a test lift before manning the basket. That would add up to 45 minutes every time, and Holland said on some jobs his crews repositioned seven to eight times a day. Multiplied across the firm’s vast fleet, the increase in set-up times was staggering. The updated standard was well-intended, and Holland was intent on keeping his workers safe. But he wanted to stay as efficient as possible, too. A mutual acquaintance connected Holland to Elliott Equipment Company. Elliott is known for their innovative designs and the acquaintance thought MYR and Elliott should talk. Holland made his pitch: The updated standard would significantly reduce efficiency on the job. He wanted his workers to be safe, but he also wondered if a purpose-built aerial work platform with some material handling capability could meet his firm’s needs without being subject to mandated test lifts every time the unit changed positions. 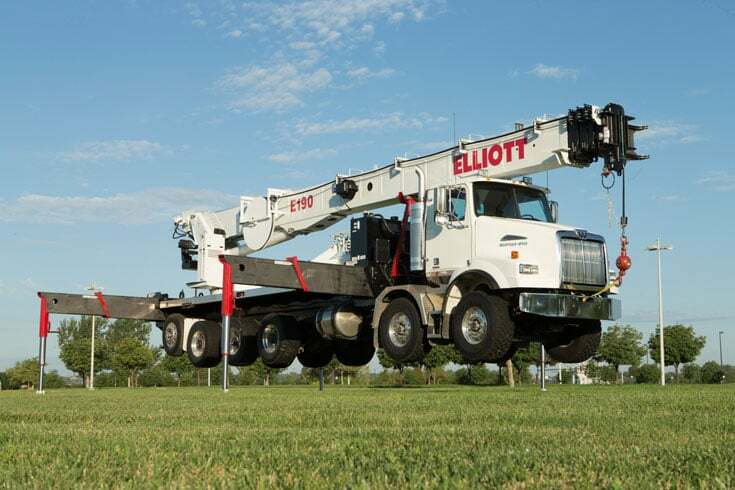 Elliott’s task was to design a machine that would comply fully with ANSI 92.2, the industry standard governing the design, manufacture, testing, operation, inspection and maintenance of vehicle-mounted elevating and rotating aerial devices in all modes of operation. E120 – Featuring a powered working height of 121’, 80’ working side reach, a 34” x 72” two-person work platform and a material handling capacity of 1,500 lbs. E145 – Featuring a powered working height of 145’, 80’ working side reach, a 36” x 72” two-person work platform rated for 1,200 lbs and a material handling capacity of 18,000 lbs. E160 – Featuring a powered working height of 160’ and available working height of 215’ with jib, 90’ working side reach, a 36” x 72” two-person work platform rated for 1,200 lbs and a material handling capacity of 30,000 lbs. E190 – Featuring a powered working height of 190’ and available working height of 207’ with jib, 90’ working side reach, a 36” x 72” two-person work platform rated for 1,200 lbs and a main winch capacity of 30,000 lbs. 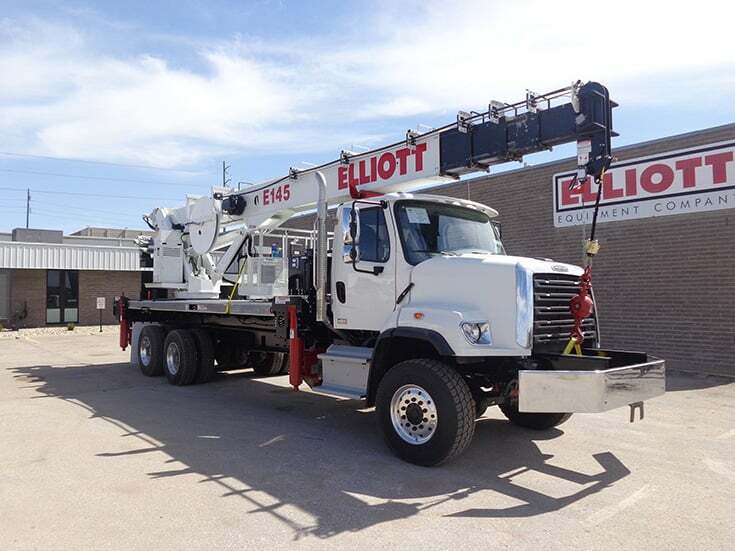 All Elliott E-Line units are built to last, featuring rugged construction and ease of maintenance to keep them on the job for the long term. They’re also protected under the best warranty in the business. MYR has enjoyed additional benefits from their E-Line investment beyond the peace of mind of having a purpose-built ANSI A92.2 aerial. The unit’s EZ Crib outriggers provide an additional 30” of vertical stroke, greatly reducing the need for manhandling heavy cribbing in off-road settings. Workers enjoy having a hydraulic tool circuit at the platform, which increases the net platform space and capacity by not having a separate power unit in the platform. Details like stainless steel grounding lugs built into the platform save additional time and weight. Perhaps the greatest benefit is the smoothness of Elliott’s controls, which allow for precise operation at height where the work is done. The impact of the Elliott E-line on MYR’s operations has been immediate. The firm already has 20 E-Line units on its fleet, each one ensuring that the demanding jobs in the electrical contracting industry are completed safely and efficiently. The fleet keeps growing, too: Holland said MYR Group intends to add two to three E-Line units to its fleet each year. In a matter of just a couple years, the company went from dreading the added set-up time on its jobs to celebrating increased efficiency with each new E-Line that joins its fleet. MYR Group isn’t the only contractor using the E-Line. Many electrical contractors across the U.S. enhance their operations with the help of E-Line units from Elliott Equipment Company. Could your firm benefit from enhanced performance and increased jobsite efficiency? Request a consultation to discuss your work and see if an E-Line model is the right fit, and find your nearest distributor here.